A colour explosion with Richard Quinn at H&M. Richard Quinn is the winner of the H&M Design Award 2017. “We believe that Richard’s collection is a great combination of creativity, technical skills and ethical thinking, which has beautifully translated into outstanding pieces that are fashion-forward yet wearable and desirable,” says Ann-Sofie Johansson, creative advisor at H&M and H&M Design Award jury chair. Head-to-toe prints, exaggerated silhouettes and a fearless attitude are the main features of Richard Quinn’s H&M Design Award 2017 collection. When creating the collection, the London-based designer looked to traditional imagery of the 1950s and 60s, but wanted to put his own twist on it, so started playing with shapes and textiles in a new way. A strapless ball gown in a multi-colored floral print echoes the New Look silhouette – built up with a corset and tulle inside, plus a balloon hem for even more volume – and is set against a voluminous metallic flower printed coat. Meanwhile, a classic trench coat goes oversized with 1980s power shoulders and features a vivid rose print lining, which can then be paired with over-the-knee stiletto sock boots in yet another dramatic floral. Throughout this whole experience, I’ve been encouraged by H&M to really hold true to my aesthetic and not water it down. I wanted to create intelligent pieces that people would want to wear – and I think we’ve done that. Richard Quinn. Born and raised in London, 26-year old Richard graduated from the Central St Martins MA course in 2016. He was awarded the H&M Design Award 2017 by a jury that included Ann-Sofie Johansson (Creative Advisor at H&M), Imran Amed (Founder, CEO and Editor-in-Chief of the Business of Fashion), Margareta van den Bosch (Creative Advisor to H&M), Yasmin Sewell (Fashion Director of Style.com), Pernille Teisbaek (Founder and Creative Director of Social Zoo) and Zanita Whittington (Creative Director of Azalle and Zanita Studio). The collection will be available in selected online markets and at the London flagship store in Oxford Circus on the 5th October. The H&M Design Award was founded in 2012 to support young designers. 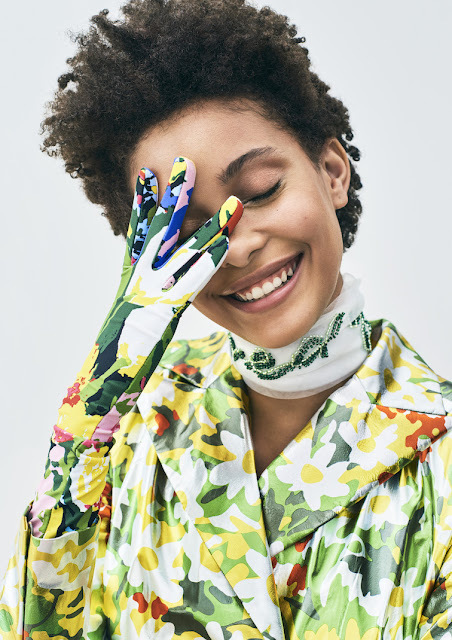 The annual prize underlines H&M’s strong commitment to the future of fashion, encouraging young designers as they embark on their careers, as well as inspiring the next generation to choose fashion as their future path.